← Microhoo! : A Good Idea? Among the many items, releases, and gimcracks arriving at our office of late, the funniest one has to be from the folks working on the Windows Home Server account. It's worth mentioning that I've also run across several people who have purchased HP's version of the Windows Home Server, dubbed the MediaSmart Server. Every one of them has been quite pleased with the experience so far. So, snaps to the person who thought up the kid's board book idea. 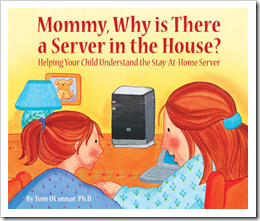 It's not likely to replace "The Lorax" in my daughter's library any time soon, but it's very amusing, and it did remind us how useful the Windows Home Server is…and make us write about it one more time. This entry was posted in Uncategorized and tagged mediasmart server, quain, windows, windows home server. Bookmark the permalink.